As well as being a post for my poor, neglected Lazy Cook section, I am sending this recipe to Forever Nigella 6, hosted this month by Kat over at Housewife Confidential. A word of advice. 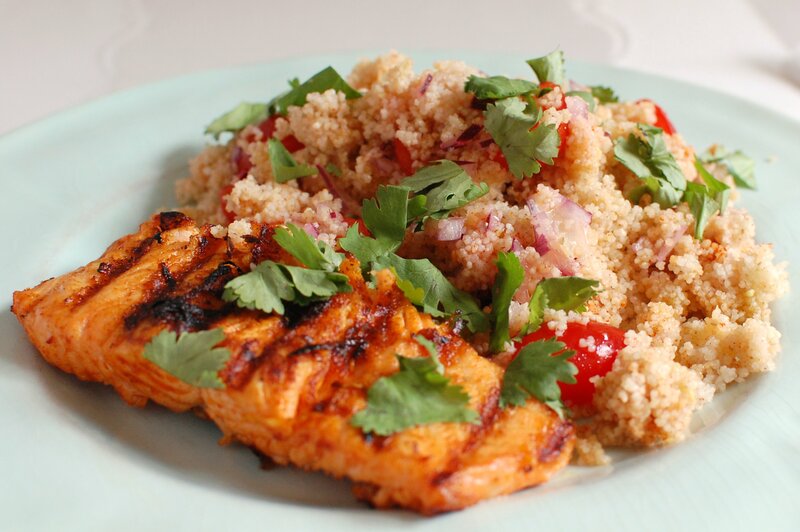 This dish relies heavily on smoked paprika, which is applied both to the salmon and the cous cous. It is needed to add colour to the salmon, but it is a bit of a bully when mixes with the cous cous, too. I swapped it out for some saffron, which added the requisite warmth and colour, albeit at a cost! This recipe is so easy, that I don't think I even need to give written instructions for it. Instead, I will leave Nigella to walk you through the preparation of this dish (skip to 0:37 to cut out the bit showing Nigella pretending to shop).